Given the important UFO and high-strangeness events taking place in Chile, we contacted researcher Rodrigo Fuenzalida of AION to get a sense of the magnitude of the situation. Chile has an extended history of UFO sightings and was considered – for decades – one of the most reliable sources of reports involving ground traces and non-humans presences. Mr. Fuenzalida took time from his busy schedule to answer a few questions posed by INEXPLICATA. Hi, Rodrigo. What’s going on in Iquique? The fact is that all of the symptoms of a UFO Wave are emerging in Iquique. Since the month of December  we have been getting UFO reports – some of them very well documented, with photographs and even videos taken in broad daylight. In the months that have elapsed since, the amassed information has been more consistent, especially because a considerable number of cases have not been made known to the press, thus eliminating any “contamination” of the communications regarding sightings. Do you think the current wave is in any way related with the earthquake? 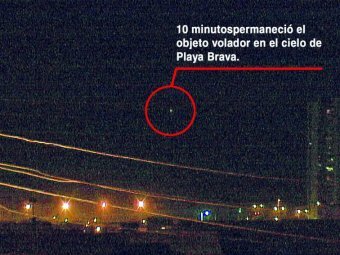 The earthquake occurred over 1600 kilometers away from Tarapacá, although UFO reports have emerged from areas affected by the quake, and there’s even material collected by various sources, such as the CNN video on a fallen building in the city of Concepción. However, sightings were frequent in the city of Iquique. We know that an earthquake is coming to northern Chile, but we don’t know when. It’s a challenge to see the measure in which seismic activity could be related to UFO manifestations. Is the wave currently experienced in Tarapacá greater than others in the past? Yes, indeed. I believe it’s the most widely documented wave in the region. Several of these reports have included records, multiple witnesses, manifestations occurring at different times of day, and sometimes low-flying objects. We’ve received reports from truck drivers in the Atacama Desert who have been a short distance away from these UFOs. We also have coastal reports involving objects being seen over the sea. With such a track record, it’s possible to consider this as the most important UFO wave in northern Chile in recorded history. What’s your take on worldwide movements that seek the “disclosure” of UFO information? I think these movements serve the purpose of institutional legitimation of the UFO phenomenon, confirming the widely known secret that several of our world’s governments have expressed concern over the subject of UFOs. Probably as a subject tied to defense, aimed at sensing the degree to which these reports involved secret prototypes belonging to some world power or another. I think they should contribute toward the challenge we face at the moment: trying to ascertain what in fact are UFOs. In order to achieve this, efforts must be focused on bolder scientific research projects regarding the subject. Any thoughts you’d like to share with your readers in the U.S.A.?